To walk around the streets of Abu Dhabi or travel to witness its historical heritage is to meet the whole world compressed into one gloriously diverse and colorful city. There is nowhere on earth quite like Abu Dhabi and no country on earth that hasn’t contributed to its multi-ethnic, multi-cultural kaleidoscope of humanity. The impeccable growth shown by the UAE region in recent times is an outcome of sheer hard work and articulate leadership of His Highness Sheikh Mohamed bin Zayed Al Nahyan. He has not only contributed in promoting and developing the country through immeasurable knowledge and innovation, but also comforting his countrymen to bestow their trust in him as a patron at difficult times. From the glistening city of Dubai to the polished governance of Abu Dhabi, Nahyan has given an alluring skyline to the Middle East. The aroma of the place excites any investor to forget the region’s troubles and make money. With the UAE leading the world ranking of being the chief nations across several key indicators, Sheikh Mohamed bin Zayed Al Nahyan, the crown prince of the UAE’s capital Abu Dhabi and the de-facto national leader disciplines 6 per cent of the world’s oil and its second-richest wealth fund. With decorum and tranquility as the trademarks of the Nahyan governance, there are no qualms within the citizens about the ruler working in the favor of the countrymen. As the country savors a famed position in the Arab world, one is likely to hear any one of several hundred languages and dialects as one is to hear Arabic. The UAE region has always been dynamic and proactive in communicating with other countries and building bridges of close cooperation and strategic partnerships to lead the way in political, economic, commercial, industrial, technological, scientific, educational, health and other sectors. In the past couple of years Nahyan has not only worked for the development of the region, but has also enhanced protection of small investors by preventing any subsidiary from obtaining shares in the parent company. A prevailing rule states that in the case of acquisition of 50% or more of the company, the acquired party should receive approval from shareholders, a step considered by the report to be an enabling one that safeguards the interests of investors. According to the Legatum Prosperity Index, 2014, UAE was ranked as the top Arab country for well-being and life satisfaction and fifth globally. The report further states that they feel absolutely safe in the country. Additionally, the UAE has maintained its presence on the ‘green list’, a classification of some 30 of the prosperous countries across the world. Notably, the UAE has been included on the list since the creation of the report. Back in 1990, when the US troops were massing in the Arabian Gulf to fight Saddam Hussein, as a young prince serving the Air Force, he started strengthening the nation’s military to be one of the most impressive ones in the world. Today, he has created a world-class country where people from different parts of the world visit for both business and leisure. The people one passes on the street reflect such a wide range of races that depict a perfect amalgamation of class and culture. The prince has bequeathed the trust of his people in the rich cultural diversity that the liberals see women in the niqab and acknowledge that none of us can or should impose our societal norms on anybody else. Nahyan has successfully established a high and dignified position for the position of his women in the society. With the self-proclaimed Islamic State taking root and Iran rising, Prince is funding his country to have more weapons and be prepared for unforeseen adversities. Nahyan has shown himself to be far more adept at reaching out to the UAE’s many faith communities than a mere ruler. The efforts of the crown prince can be deeply understood by the fact that UAE is being ranked high on many global competitiveness indicators. According to a 2015 report by the Federal Competitiveness and Statistics Authority, the country was ranked first among Arab countries in 10 out of a total of 15 global competitiveness reports, as well as first globally in the confidence indicator. Third year in a row, the UAE was ranked first regionally in global competitiveness and 12th globally according to the 2015 annual World Competitiveness Yearbook. It was also ranked first regionally among the countries of the Mena region and 12th globally in World Economic Forum’s Global Enabling Trade Report 2014. In addition, the country was ranked first globally in three global competitiveness indicators in the tourism sector alone. 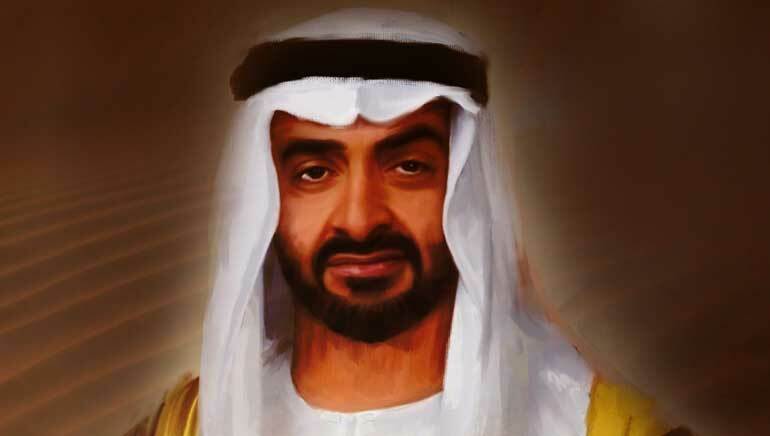 As he raises his country’s standing, Sheikh Mohammed bin Zayed Al Nahyan launched projects in the UAE stems from the belief that the key driver for shaping a strong and well-developed economy lies in the establishment of a modern infrastructure. It is considered to be a primary role due to the pivotal role that infrastructure plays in the progress and growth of countries, and in stimulating economic activity. The Roads and Transport Authority (RTA) in Dubai will begin the double-decking of Sheikh Zayed Road, building a 35-kilometre elevated section of highway running from Dubai Creek to Jebel Ali Port. This ambitious project, with an estimated cost of Dh10 billion, will facilitate increased traffic on Dubai’s main arterial road. The RTA has already received bids and implementation offers towards the execution of this project. With a total capacity of 2,060 MW of electricity and 140 million imperial gallons of water per day, the M-Station adopts the highest levels of availability, reliability, and efficiency, using the most advanced technologies in the world. Launched in 2013, the Abu Dhabi- Dubai Highway project was awarded to three companies. The project aims to alleviate traffic congestion on the current main road connecting Abu Dhabi to Dubai, and is expected to be completed by 2017. The Road and Transport Authority (RTA) launched plans to develop and design the expansion of the Dubai Metro to include 70 stations by 2020, at a total cost of Dh5 billion. The expansion of the Green Line will include 11 new stations stretching over 20 kilometres across Dubai. The Red Line expansion plans include the addition of 3.5 kilometers between the Rashidiya Station to Mirdif City Centre Station as well as an 8 – 10 kilometre expansion from the Jebel Ali Station to the Dubai Expo 2020 venue. The Emirate of Dubai launched the third phase of the Dubai Canal project, which was started in 2013, and has been adopted by the RTA. A contract worth AED802 million for the third phase of the project was awarded to Belhasa Six Construct Co. The project comprises the construction of a water canal linking Dubai Creek with the Arabian Gulf. There is no doubt that investment in space programmes and projects will enhance the status of the UAE and increase the nation’s stature in the regional and international landscape. It represents a fundamental shift in the process of scientific research in the UAE. The projects implemented by the country in this vital area will significantly contribute to the economy, creating new jobs for nationals of high potential. Khalifasat, the third advanced satellite launched by the UAE into space, will provide high quality images that fulfill the needs of government organisations and private enterprises. While the initial manufacturing process began in South Korea, the satellite will be completely developed by Emirati workforce. In an attempt to make UAE a more vivacious place to be, the command has prioritized its youth from the early days of the Federation and spares no effort in empowering them with access to scientific knowledge and advanced facilities. Nahyan, the crown prince of Abu Dhabi and the UAE government work strategically to provide best-in-class education to Emirati youth qualifying them for the job market. The government also encourages employment of Emiratis in the private sector due to its importance in social and economic development.